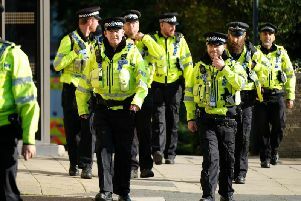 A week of action to tackle knife crime is being launched by West Yorkshire Police as forces across the UK turn their focus onto those carrying the weapons. Officers across the county will be carrying out targeted enforcement work, supporting educational activities and promoting anti-knife messages. Knives taken off the streets of West Yorkshire during a previous amnesty. Detective Superintendent Chris Gibson, the force's operational lead for knife crime, said: “The number of crimes involving knives continue to increase across the UK as whole – and West Yorkshire is sadly no different. “Knives aren’t the answer and I have seen first-hand the devastation using a knife can have, not just for victims and the families of victims, but for perpetrators too. “Statistics have shown that if you carry a knife for protection, you are putting yourself in danger as it is likely to be used against you – around a third of knife-related injuries are caused by the victim’s own knife. Throughout the week of action, officers will be carrying out test purchase operations across West Yorkshire to check if retailers are willing to sell knives to under 18s. Det Supt Gibson and his team will also be using education and early intervention to try and reduce knife crime among young people. Officers will be speaking during school assemblies at both primary and secondary schools, and joining pupils on school buses and on the school run to educate young people on the dangers of carrying a knife. Det Supt Gibson said: “Educating the public on the dangers of carrying a knife is key. We hope by getting the message out there, we can potentially stop more people from taking knives onto the streets. “This campaign is important in raising awareness of knife crime and we will continue to prosecute those who carry knives. However, the enforcement work we do is only part of the solution – the public also has a role to play in this. It follows the latest round of Safer Communities Fund grants by West Yorkshire's Police and Crime Commissioner (PCC), with the focus being given to tackling violent crime. Mark Burns-Williamson said: "A number of the recipients are running projects that directly reduce the carrying of knives on our streets and educate people about the awful and wide ranging consequences. “I’m also chairing the National Task and Finish Group for PCCs and developing work around the local strategies aligned to the National Serious Violence Strategy. This will include co-ordinating bids to the £22m early intervention fund that has just been announced, of which a number of West Yorkshire bids will be submitted. “During my visits to local groups and engagement with communities, I have heard, often first-hand, the truly horrendous impact they can have on people’s lives and those around them. “We need do everything we can to stop this and I would echo Detective Superintendent Gibson’s comments in asking for your help in rejecting knife crime. “Likewise, I would encourage everyone to get involved where they can, whether that is by reporting any suspicions or speaking to family and friends about the dangers." Anyone with concerns about knife crime can call police on 101 or make an anonymous report via Crimestoppers on 0800 555 111.